Learn from the Legends is a modern classic. 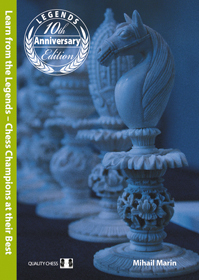 ChessCafe chose it as their Book of the Year and IM Jeremy Silman went even further when he wrote: �I can�t recall having seen a better book in the last two decades.� Ten years after the original publication, Quality Chess is proud to offer a revised hardback edition with a new chapter on the latest chess legend, Magnus Carlsen. Mihail Marin is a grandmaster from Romania. His books for Quality Chess have established him as one of the world's finest chess authors. 423 9. Quo Vadis, Magnus?